Spend the 15th (Fri) exploring nature at Cape Breton Highlands National Park. For photos, traveler tips, where to stay, and more tourist information, use the Ingonish vacation builder. Frankfurt, Germany to Ingonish is an approximately 19-hour flight. The time zone difference when traveling from Frankfurt to Ingonish is minus 5 hours. In September, daytime highs in Ingonish are 24°C, while nighttime lows are 12°C. Cap off your sightseeing on the 18th (Mon) early enough to go by car to Sydney. Sydney is a population centre and former city in Nova Scotia, Canada. 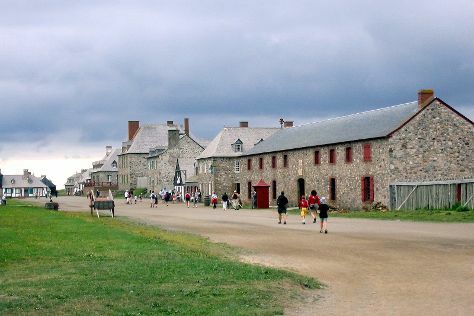 Explore the numerous day-trip ideas around Sydney: Miner's Museum (in Glace Bay), Baddeck (Uisge Ban Falls, Alexander Graham Bell National Historic Site, & more) and Louisbourg (Fortress of Louisbourg National Historic Site, Louisbourg Lighthouse Coastal Trail, & more). There's still lots to do: take a memorable drive along Cabot Trail, brush up on your military savvy at Cape Breton Highlanders Museum, explore the activities along Bras d'Or Lake, and make a trip to The Big Fiddle. To find ratings, more things to do, other places to visit, and tourist information, read Sydney trip itinerary builder. You can drive from Ingonish to Sydney in 2.5 hours. In September in Sydney, expect temperatures between 23°C during the day and 12°C at night. Finish up your sightseeing early on the 22nd (Fri) so you can travel back home.